The US has imposed sanctions on six people and three companies it says have ties to Iran's elite military force, the Revolutionary Guard Corps (IRGC). 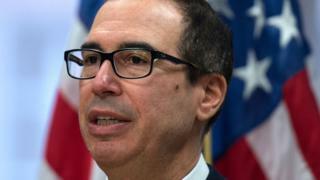 Treasury Secretary Steven Mnuchin said the penalties targeted those who had funnelled millions of dollars to the group, funding its "malign activity". Iran's central bank helped the IRGC to access US dollars via "a large-scale currency exchange network," he said. The Treasury Department said all six individuals were Iranian. US individuals and entities will be barred from doing business with them following the move, which was carried out in conjunction with the United Arab Emirates (UAE). "The Iranian regime and its central bank have abused access to entities in the UAE to acquire US dollars to fund the (IRGC's) malign activities, including to fund and arm its regional proxy groups," Mr Mnuchin said in a statement. "We are intent on cutting off IRGC revenue streams wherever their source and whatever their destination," he added. Mr Khomeini quickly set up the IRGC to protect the state and defend the principles of his revolution. It has since grown into a major military, political and economic force in the country. With thousands of troops and advanced military equipment, the Guards have been behind many of Iran's key military operations. The new penalties come just two days after Mr Trump pulled the US out of the Iran nuclear deal and pledged to ramp up pressure on Tehran. The 2015 agreement curbed Iran's nuclear activities in return for the lifting of UN, US and EU sanctions. Mr Trump's decision to abandon the deal was described as a "mistake" by Iran's supreme leader, Ayatollah Ali Khamenei. What has Iran been doing? Israel accused the Quds Force of launching 20 rockets at its military positions in Syria on Thursday morning. The Israel Defense Forces (IDF) said that four rockets were intercepted and 16 others fell short of their targets in the occupied Golan Heights. 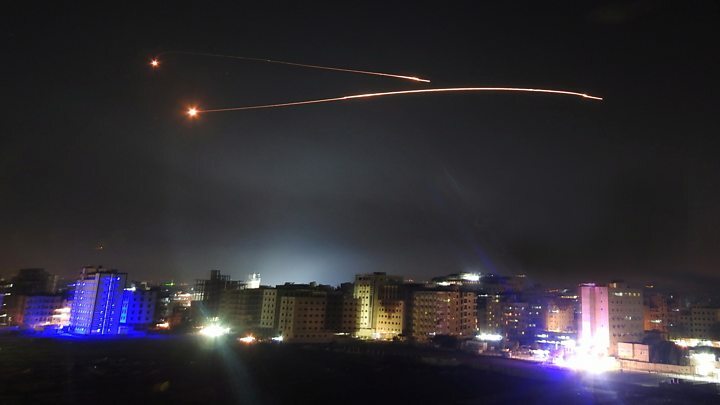 Iran's deployment of troops to the country to help President Bashar al-Assad has alarmed Israel, which launched a wave of strikes in retaliation for the attack. The IDF said fighter jets struck 70 military targets belonging to Iran inside Syria, causing significant damage. Targets included intelligence sites, military posts and weapons storage warehouses.